We are in Queenstown, New Zealand. Today we went on a trip to visit some of the locations where Lord of The Rings was filmed. One of them was the Arrow River, one bank of which was used for the Ford of Bruinen where the Nazgûl attempted to capture Frodo and the One Ring. Our guide, Chris, showed us a still from the film and asked, “How many Nazgûl were there?”. “Nine!”, we answered inconcert. Chris counted the figures in the picture and got to ““11, maybe 12”. 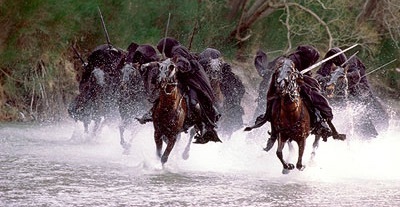 Nine riders, apparently, did not look sufficiently impressive, so Peter Jackson added some more. Not only that, but as Chris explained, the riders’ parts were played by a bunch of Kiwi girls from the local pony club.